I'm looking for one of these? Any advice for hunting Nakina Ontario;such as camping areas,starting points? Thanks for your question Richard. I don't know the area myself, but we do have several contributors from Ontario, hopefully one or more can help you out with where to hunt near Nakina Ontario. Good luck on your hunt..
Hi, I have hunted the Nakina Area for several years now, and know the area quite well. The last 2 years our group has bagged 4 moose including an absolute monster buck in 2011. The best advice I can give you is to buy a good Topo map, and find isolated water sources (small rivers off the beaten path are the best). The reason for this is because Nakina has an abudance of moose and more and more people are learning about this place. The hunters tend to camp right off the trails and on the shores of the main lakes. This pushes the moose back deeper and deeper into the woods and forces them to feed and drink in those isolated swamps and rivers. The last 2 years we have seen about a dozen moose in spots like these (4 the day before the season started last year). Luckily for us, some of the hunters that go to Nakina take it for granted that they will see moose, and they sometimes hunt right on the main trails or right from their camp sites, meaning that these isolated oasises are always uninterupted by other hunters. As for Camp sites, I camp at Lucy lake, and it is a terrific spot since you have clear water, a beach for easy access and campfires, plus the Splake fishing is terrific. It is also in the middle of it all, another good place is Boston Lake. Boston lake is a better spot if you prefer to glass for moose or call, since a lot of the area is clear cut and was control burned about 10 years ago. Last year, I caught a glimpse of a monster bull in my secret spot (no way i'm posting this location online). Who must be about 6-7 years old, and has a 65-70 inch rack. Im going back to get him this year, he is worth the half hour ATV ride, the 2 hour trek up river/rapids and half hour trek through the bush. It leads to exactly what I described, a small creek, which is blocked by a beaver damn and created a swamp about 50-75 yards in diameter. Right now in your beautiful Nanika, my niece and her husband (environmentalist's) are in their favorite place for a hunting vacation. I can't wait to hear all about it. Oh to be young again for the possible adventures. All who read, please take advantage of our beautiful north country while you can. Just wondered how the last seasons moose hunt went? I own a couple outfitter camps in the area. I do hunt in Nakina, but I can't find the BOSTON lake in the map. Please, if somebody can help me with the coordinates. Thank you. I am from Kitchener Ont. I looked up Boston lake on Google Earth. The co-ordinates are shown in the photo link. Hunting restrictions in Nakina area? 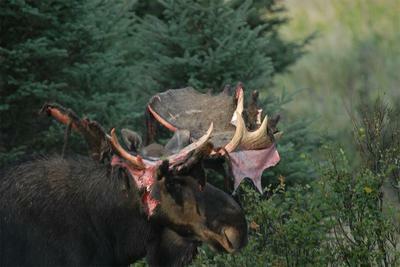 We are heading up to Nakina this year for our moose hunt, planning to camp NW of Nakina. I heard that some areas are restricted to moose hunting. I am not sure if this is because of native restrictions or outfitters, or game reserves. Can anyone shed some light on this? Are there areas that we should avoid? I have hunted Boston Lake for 2 years now and only seen 1 set of tracks... I seen all the hype about Boston Lake but there was next to no sign of moose... any other good places?